Valencia was founded by the ancient Romans in 137 BC and has been pillaged, burned, and besieged numerous times by various conquerors since, but vivacious Valencia has nevertheless sailed into the second millennium as a sophisticated, modern holiday city, a favoured location for the America's Cup yacht race. Situated on the Mediterranean coast about four hours south of Barcelona, Valencia is spread out around its busy port and backed by hills which give way to the plains of Aragon. 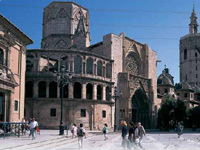 Valencia oozes traditional character, particularly in its old town (El Carmen), and has retained its cultural heritage not only in the form of medieval architecture but also in its quirky, exuberant festivals (like the Battle of the Flowers, the fireworks of Fallas and even one dedicated to tomato-hurling). The Valencians even have their own language. Interspersed with the old and historic, however, there is much that is new in Valencia, including its major attraction, the seemingly futuristic City of Arts and Sciences, which draws around four million appreciative visitors each year. Outdoors, it is hard to beat the golden beaches which fan out from the port along the coast, and the sprawling city offers plenty of green parks for strolling, cycling or simply lolling on a bench to get your breath back after indulging in the vibrant life of the city. Football is a local passion, and fans should not miss the atmosphere at one of the carnival-like Valencia FC home matches. When night falls, dine on paella, which originated here, and then hit the town, because Valencia is renowned for its lively collection of bars and clubs.